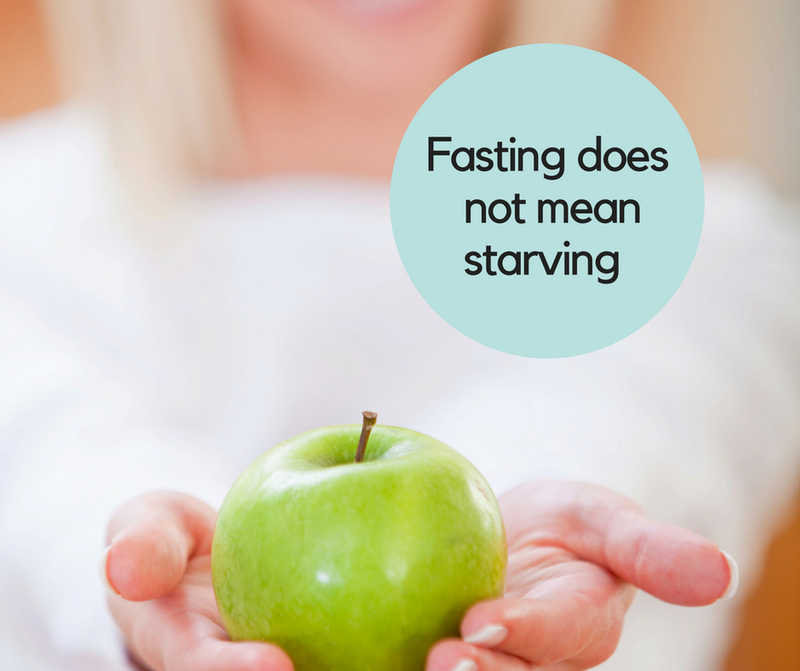 Fasting is one of the oldest therapies in medicine, recognized for its ability to help heal and prevent disease. When done under the proper guidance of a healthcare professional, intermittent fasting can lead to effective weight loss and long-term health benefits. So, you might be wondering, what’s the difference between intermittent fasting and starvation diets? Well, for starters, starving yourself is dangerous! This isn’t a competition of “less is more.” Our bodies still need fuel to function. Starvation deprives our body of essential nutrients, so it begins eating itself by burning muscle. Fasting differs from starvation because it can be practiced for 12, 16, 24, 36 or even 48 hours without the body kicking into starvation mode. Fasting flips the metabolic switch safely and effectively by using one fuel source instead of another. Typically, our bodies are fuelled by glucose, which is a simple sugar. However, through diet restriction or intermittent fasting, that energy source gradually becomes unavailable. As a result, the body begins to convert its stored fat into fatty acids that are easily absorbed by the bloodstream. Fatty acids produce molecules called ketones. (This may ring a bell if you are familiar with the ketogenic diet.) After 8 – 12 hours of fasting, our metabolism shifts to replace glucose with ketones as our new source of energy. In a world of fad diets and weight loss gimmicks, studies show that intermittent fasting may be better for you than other dietary strategies. This is because ketones put less stress on our cells compared to the by-products of other dieting methods. Studies also show that intermittent fasting can produce benefits no matter how it’s accomplished! In one study, participants were allowed to fast for any number of hours a day, and then eat whatever they desired during the remaining hours. In another study, dieters alternated fasting and feasting days. On their non-fasting days, dieters either restricted their diet or ate to their hearts’ content. In both cases, results showed significant weight loss, no matter the approach! Furthermore, participants in both studies did not lose any significant amount of lean tissue (which includes bone, muscle and organ tissue). This is in contrast to other dieting strategies which can sometimes cause the loss of both fat and lean tissue, impacting health negatively in the long run. Speaking of the long run, did you know that intermittent fasting helps you to live longer too? It’s true! New research from Harvard shows that intermittent fasting manipulates the mitochondrial networks inside our cells, which may increase lifespan! Sure, that sounds great! But how does it work? Simply put, inside our cells we have energy-producing mitochondria that dynamically change shape in relation to our body’s energy demand. Over time, their ability to produce energy gradually declines, eventually leading to age-related diseases. While fasting is often recommended as a way to promote healthy aging, the connection between metabolism and mitochondria has always been unclear… until now! The Harvard study shows that low-energy conditions, such as periods of intermittent fasting, can help maintain the flexibility and youthfulness of mitochondrial networks. These youthful networks then communicate with other parts of the body (organelles called peroxisomes) that modulate fat metabolism, which as a result, helps to increase lifespan. As mentioned, there are numerous different ways to fast that are equally effective. Below are a few fasting tips to help you on your way. Set a fasting schedule and stick to it. If you’re a beginner, meal skipping is an excellent way to introduce yourself to fasting. If you choose to do a 12 or 16 hour fast, arrange your fasting window during sleeping hours to help the time pass by more easily. Fasting for 24 hours once a week or alternating day fasting are other options to try. Be sure to consult your healthcare professional to determine what might work best for you. Stay hydrated. You might be limiting your intake of food, but you certainly shouldn’t limit your consumption of calorie-free beverages. Be sure to drink plenty of water or switch it up with herbal teas. Relax your body and your mind. During fasting days, don’t participate in strenuous activities or spend your time obsessing over the food you can’t eat. Go easy on yourself by finding things to keep your body and mind occupied in a productive, gentle way. Take a walk or do light exercise that won’t exhaust you, like yoga. Spend a few hours binge-watching your favourite TV show or catching up on emails. Your next meal will come before you know it! Make your calories count. Between fasting windows, enjoy nutrient-dense foods that provide protein, fibre, and healthy fats. Learn how to increase flavours without sacrificing calories by adding garlic, herbs, spices, and different types of vinegar to your dishes. If you think you are thinking about intermittent fasting but have never tried it before, I invite you to please reach out to our clinic so we can discuss which options might be best for you. Please feel free to book an appointment with us by calling or emailing and we can help you get back on track with better weight management and a healthier, longer, and happier life!